What are the main traffic sources for your website? When it comes to website traffic, there are a couple of sources where a website can get traffic. There can be direct traffic when a visitor types the website’s URL on their browser or their bookmark. Another source will be from referral traffic from a link posted on another website. There is traffic from search engines after you search for keywords on search engines. Another source will be from campaign traffic for campaigns you run on email blasts, buying visitors, banner ads and Google Adwords. Take your web traffic as a river which is being fed by four sources. The best thing is for you to have a balance with these four sources and you will be sure of steady flow of traffic. These are people who are aware of your business and will type the URL into their browser or have your link saved in their bookmarks. Search engine experts recommend that direct traffic should make up 20% of your traffic. If you are using Google Analytics, it will refer to traffic obtained from other sources and not their search engine as referral link. Experts advise that your referral traffic should make up for about 20-30% of your total traffic. This is traffic that’s obtained from search results on search engines. This is also referred to as organic search engine traffic. This kind of traffic should make up about 40-50% of your total website traffic. 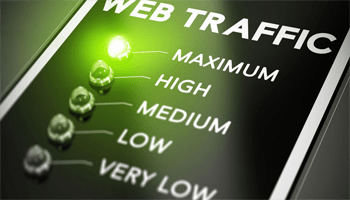 From the description of each traffic source, it is evident that you should work hard to build on each of them. You can do this by buying traffic for your website from reliable and experienced SEO experts.